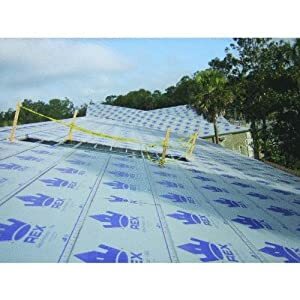 5 Best Roof Underlayment Reviews: Fresh Ratings in April 2019! Underlayment is either a felt based or synthetic fiber-based water-proofing barrier that covers the roof deck and is placed under the final roof cover. This underlayment is used to add extra waterproofing and cold protection. Underlayment is not insulation and is placed directly over the roof deck under all other coverings, including insulation. 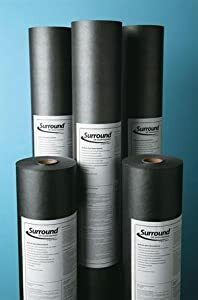 Asphalt-saturated felt: This was the most popular underlayment of choice around 15 years ago. It started to be replaced by the introduction of synthetics. It is commonly known as “felt paper” or “tar paper” this material is made of varying mixtures of cellulose, polyester, bitumen or asphalt. All materials have a basemat, which is the flexible base layer and in this case, it is saturated with asphalt for water resistance. Synthetic underlayment: This is the current popular material of choice, and is used by most construction and roofing experts. Synthetic underlayment basemat is saturated in asphalt and has an additional mix of fiberglass to give the product strength and to be more tear resistant. High-quality synthetic underlayment will include a scrim reinforcement which reduces slippage even when wet. Rubberized asphalt: This is the most expensive option, and this is because it contains higher percentages of asphalt and rubber polymers. This mixture makes it completely waterproof. Rubberized asphalt roofing underlayment usually comes with a sticky back and a protective membrane that is removed before installation. This backing is the waterproof seal that separates the underlayment from the clean roof deck. Rubberized asphalt roofing underlayment is the preferred underlayment option for valleys and roof protrusions. This guide will categorize the underlayment by type, material specs., and dimensions. To get into this list, the product had to be in the top of these categories including price per square inch value. 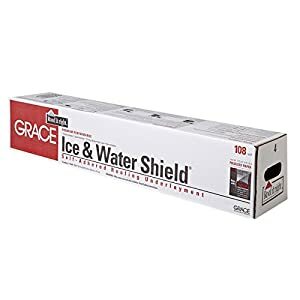 Grace Ice & Water Shield® is a double layered underlayment. The basemat is rubberized asphalt, and the cover layer is a high-density cross laminated polyethylene. The basemat is covered with an adhesive surface that is protected by a foldless paper. This model comes with Ripcord®, which is a proprietary ripcord which is embedded into the basemat and is used for a quick release on-demand basis. Specs: Double layered Rubberized Asphalt basemat with high-density cross laminated polyethylene cover. 108 square feet per roll. This is very easy to apply the product, and the ripcord for quick release is a great solution that prevents mistakes when laying the product. All in all, this is very good value for money and is totally waterproof, its online sales price is actually very low for a rubberized Asphalt product, as such its number one on our list. Surround VR Underlayment is a strong alternative to felt and provides excellent full waterproofing qualities that exceed 30# felt by 10x. Apart from this added strength, the material is lighter than conventional felt and only weighs in at 1Kg per square foot. Another advantage that these rolls have is their width, which is wider than most conventional coverings, so you actually get more surface coverage per single roll than its competitors. This product meets a lot of ASTM specifications including ASTM E108, D1970, E96, D4869, D4533, D751, D751, D5261. This makes the Surround VR one of the leading reliable products on the market and well worth their weight price ratio. This is the LinerLock® (LL-120) which is 10x stronger than #15 felt and is 100% recyclable, and resisting mold growth. This model comes with a proprietary skid retention surface to prevent slippage. 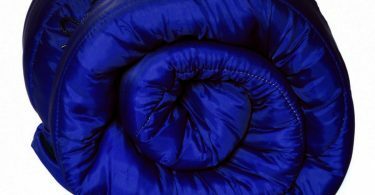 This product is designed with 4-ply lightweight synthetic layers. Material: 4 layers: slip resistant non-woven top layer, anti-oxidant UV resistant second bonding layer, woven Polypropylene layer, bottom anti-skid layer. This is a very efficient product that cuts down deployment time when compared to other brands. 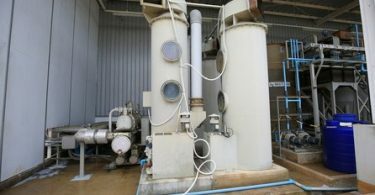 It also meets ICC AC207 Acceptance Criteria approval as well as CAN/CSA A123.22; ASTM D226 and ASTM E108. In terms of price per square foot, it is very budget friendly and combined with its ergonomic laying prowess; this makes for a good investment. 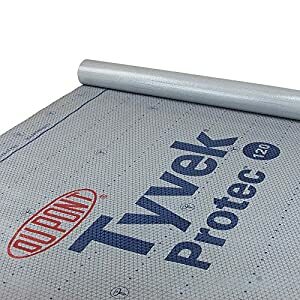 Tyvek® Protec™ is DuPont’s synthetic roofing underlayment. This is one of the leading brands there is on the market, and its price does not reflect this since it is very affordable and budget friendly. This model has a unique embossed pattern that provides better traction and grip for walking on the roof. It is obviously waterproof and has a great anti-slip surface treatment. The list of ASTM and other certifications is too long to mention here; the attached spec sheet gives it all. Bottom line, this is perhaps one of the best and most well-known brands of roof underlayment there is. If you want to be backed by a global leader, then DuPont is the way to go. REX™ SynFelt is a woven synthetic roof underlayment that comes with 20x strength to standard 30# felt as well as being much lighter. In comparison to its competitors, it comes in with equal stead. It gives equal strength, waterproofing, and price per square inch value. It also comes with a pre-printed nailing pattern so that appliers can easily and swiftly nail it on the deck. This is a fully certified underlayment that is very popular all over North America. It’s a reliable, rigid and easy to apply product and well worth its place in this guide. 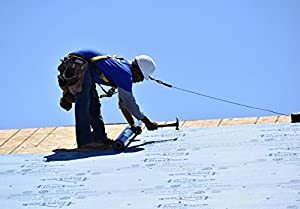 Any roofing work is hard, its hard due to its location more than anything else, but it’s also hard since you are exposed to the elements, you are on a sloped surface, and you might have plenty of lifting, bending and climbing to do. Let’s start off by stating that some jobs are best left to the pros. This is one of them. Even if you are young and able-bodied, the issues of safety come first, as well as the various tricks of the trade, and there are quite a few tricks that develop over time in different weather zones. Take into account that when choosing an underlayment, you have to consider its place in the roof hierarchy based on the other elements you will be using. These elements are determined by the weather conditions you live in. The hot, dry desert environment is totally different from the ever cold and cooler climates of North Dakota or the hot and humid climates of the southern coastal states. If you have decided you want to save money by DIY, then just add the fact that you will be lifting 25lb rolls, one at a time, climbing up and down a ladder many times, and then bending over to nail in the product. You should come prepared, which means to have a steady ladder, a good roofing nailer, and the right protective gear. Here is theFEMA Underlayment guide PDF, well worth reading. Don’t rely on safety gear for protection, rely on good old common sense and safety gear together. Do not perform steep slope work, leave this to the professionals. Invest in an all protection kit that includes a harness, rope and hook, these cost around $100 at home centers. Wet roofs (from rain or humidity) are slippery, always wear soft rubber sole shoes. Always sweep the roof surface for your work, make sure you place the underlayment on a clean surface. If you have ground help, make sure they wear a helmet and goggles at all times. Roof work tends to let things fall down, from small nails to whole rolls. Never throw anything down without calling out first and getting a reply. (Use a mobile phone or walkie-talkie unit for added communications safety). Place all ropes and extension cords, so they’re not underfoot, and when you walk, don’t run, or skip, and watch out for these ropes and cords. Make sure your ladder is strong enough to support your weight plus an additional 80 lbs. Always make sure the top of the ladder extends over 3 ft. above the roof edge. This will give you support when you climb up and down from the roof. Don’t overclimb the ladder; this means you get off the rung that is under the roof level only. It is prudent to construct scaffolding for installing the drip edge and first few courses.